I have entered the competition this year for the 4th year in a row and each year has been a wonderfully unique and rewarding experience. Three out of my four years have also been in distinct categories, starting with two straight years in the Project Manager category; then last year in Strategic Team, and now this year in the brand new Clinical Team Manager category – which is what my actual role has been for the past 5 years. I wish I had been aware of this competition in my time as a CRA, as I would have certainly applied in that role as well. The CROY competition gives you an opportunity to really test your mettle – specific to clinical research as a whole – against the best of the best. You walk away with a true sense of accomplishment and energy being surrounded by such an accomplished and positive group of individuals. This feeling is amplified when you achieve a medal for your accomplishments. Even more indicative though, is the motivation and passion you feel when you don’t walk away with that medal. You simultaneously feel passionate about pushing yourself that much harder to medal in the future but also accomplished for even making it to participate in round 3 of the competition in person. I entered the 2017 Clinical Researcher of the Year competition with Pharma Times due to the encouragement of my former PRA manager, Ellie Allain. The day of the competition I was given a research scenario similar to experiences I’ve encountered during my monitoring visits. The challenge was that I had to present the scenario and discuss the issues found to the judges via a Power Point presentation. I was nervous but the judges were patient and understanding; it was then that I clicked into CRA mode and with all of the research knowledge I’ve obtained over the years, gave the best presentation I could give. Through this enlightening experience, I had the privilege to mix and mingle with a host of wonderful colleagues and fellow researchers. I didn’t win in my category; nonetheless, the ultimate victory for me was the satisfaction of knowing that I had done my very best and that I can accomplish anything by overcoming the hindrance of fear. Participating in the competition last year was a wonderful experience. It allowed me to meet other passionate clinical researchers beyond my own network. And the advice given to me by the various experienced professionals involved, including judges, peers, and even from friendly competitors has been helpful to grow my knowledge. Participating in the PharmaTimes Clinical Researcher of the Year competition in 2017 was an incredible opportunity, convening with the top professionals from the best companies in the clinical research industry. The competition allowed me to put my knowledge and experience to the test, eliciting fantastic feedback from the panel that was constructive and allowed me to then adapt my skill set as an effective Project Manager. It was an honour to be able to represent my company, and showcase the top-level talent that we cultivate within our organization. I am already excited at the prospect of returning to the finals this April, to once again network with the brightest minds in the industry. It was an amazing experience to be part of the gold medal Strategic Partnership Team of the Year at the 2016 PharmaTimes Clinical Research of the Year competition! I have been working with my teammates from PRA and CytRx for years, and it was extremely rewarding that we could leverage our experience, trust and ability to communicate and collaborate. We proved that we are truly an integrated team! That said, the competition itself and the process of participating in it was a valuable learning experience, which has enriched our day to day working relationship. I am so thankful for the opportunity the competition provided, and so proud of my team and our result! Stephanie Gonzalez, Director of Project Delivery, PRA and team member of Strategic Partnership Team of the Year 2016. 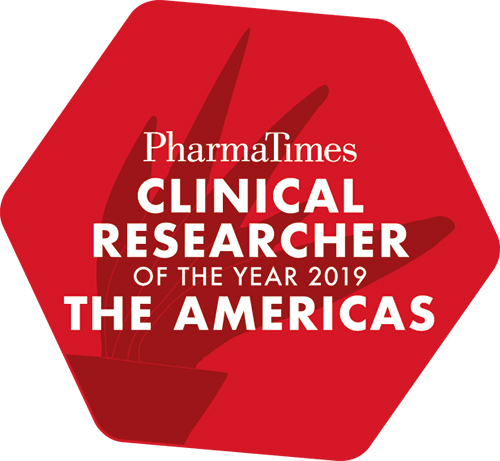 The PharmaTimes Clinical Researcher of the Year - The Americas Competition was an opportunity to apply my knowledge and test my skills of 10 years of clinical research, and be recognised by several top professionals in the area as the winner of Experience CRA category. During the competition finals days, I had the pleasure of meeting amazing colleagues from different organisations,discuss best practices and share experiences. I am sure every finalist went back home more knowledgeable and with new ideas to apply in their day to day business. For me, be recognised as winner means that I am building my career in the right direction, since I have always worked hard to accomplish metrics and deliverables, with dedication, respect, ethic and enthusiasm. Finally, the competition contributes to emphasise the importance and real objective of clinical research, and gives us the opportunity of being recognised internally by our company, and also by the pharmaceutical clinical research market. Raquel Amorim, Senior Clinical Research Associate, PRA and Experienced Clinical Research Associate of the Year 2016. The Clinical Researcher of the Year competition is a great way to test your skills against other professionals outside of your company. It allows for us to think “outside of the box”and really look at innovative ways to address common challenges within our industry. Going into finals was very exciting to me as I didn’t know what to expect or if the situation would be one in which I had experience. I truly didn’t know the caliber of others in my group so it made me work even harder to set myself apart. Winning was one of the most amazing feelings. I had turned to my husband when the other winners in my category were announced and stated that I didn’t think I had placed. It really made me confident in my knowledge and skill and gave me the realisation that I was truly doing the right thing for clinical research and my sites. Lisa Ince, Senior Clinical Research Associate, Quintiles, and New Clinical Research Associate of the Year 2016. The PharmaTimes Clinical Researcher of the Year competition is an excellent opportunity to connect with other top research colleagues and showcase your individual talents and skills. The final day of the competition reflects real world situations, timelines, and critical decisions that we face on a daily basis. For me, winning the CROY Award is a personal acknowledgment of my commitment and dedication to my study volunteers over the last twenty years. Most importantly, I am proud to represent Clinical Research Coordinators’ hard work and pivotal contributions to the drug development process. No medication would be on the market without us. Robert Robbins, Clinical Research Director at Pinnacle Trials, Inc. and Clinical Research Coordinator of the Year 2016.